Your collectible stone or glass knife will need some special accessories to show it off or to protect the fragile blade. Available here are a few stand and sheath options. Also offered below are some knife handle options that are used in the creation of the knives by Dr. Arizona that are sold elsewhere on this website. This is a special knife stand especially designed to showcase your Obsidian Knife. 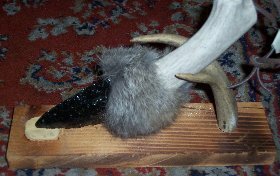 There is a hard wood base with an attached natural antler fork and soft leather pad. You place the handle in the fork and place the blade tip in a depression on the soft leather pad (or the other way around if desired). This is a special knife sheath especially designed to showcase your Obsidian Knife. It is made out of soft elk hide with alternatively fringe or beaded decoration. Each sheath is individually handcrafted and thus order fulfillment may take up to a month. If you order a specific knife your sheath will be made to fit. Otherwise, please list desired dimensions in the comment section while ordering. This is a special knife sheath especially designed to showcase your Obsidian Knife. It is made out of relatively hard cow hide. Choose between a simple Plain or Beaded Design. The Plain design can be chosen to have a Belt Loop backing. Each sheath is individually handcrafted and thus order fulfillment may take a few weeks. If you order a specific knife your sheath will be made to fit. Otherwise, please list desired dimensions in the comment section while ordering. Here are a selection of items that can be used as Handles for making your own knife. 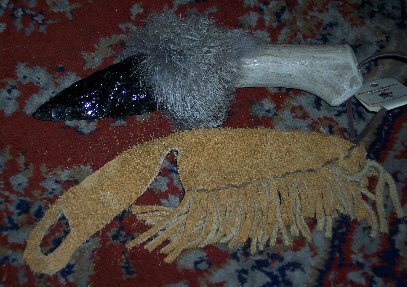 The antler handles are cut sections of weathered antler that is slightly polished and has rounded cut edges. The short options are approximately three to four inches whereas the long options are five to six inches. There will be a significant variety in actual dimensions, degree of curvature, inclusion of side branching, degree of weathering, etc. Creation of a Hafting depression is left to the purchaser. The Wood Handle is a rough section of solid Oak branch approximately five inches long.